Remove bread from loaf pan. This one is quick and reasonably healthy. I suggest using RapidRise® yeast. Add all ingredients except the cinnamon into the bread machine pan. Select the quick cycle and light crust, if your machine has the crust setting option. Start machine. When you hear the signal to add ingredients, add the cinnamon. Two hours later you’ll have hot cinnamon bread for breakfast. Tomorrow you can slice the leftover bread for French toast or cube it for making a bread pudding dessert. When I first purchased an Instant Pot last year, I had no idea how popular the brand was. I selected it because of its stainless steel inner pot. Most electric multi-cookers have coated aluminum pots, and inevitably that “nonstick’ coating flakes off and into my food. Ugh! Soon the enthusiasts (AKA Instant Potheads) sucked me into their cult. There are hundreds of online groups and blogs devoted to this wonder appliance. Sales of Instant Pot skyrocketed. Soon supply fell behind demand and waiting lists developed. Wow. What had I gotten into? I’m already a pressure cooker veteran (I now own six! Don’t judge me. :-P) and won’t give up my reliable stovetop models, but I quickly saw why the Instant Pot was and is popular. Its safety features and ease of operation boost the confidence of even the non-cooks in its cult following. I suspect Instant Pots are making a dent in the fast food industry’s profits because Potheads stay home now and cook for their families. And brag about it! If you have a 6 quart Instant Pot, the most popular size, there are a few things you need to know about the 3 quart Mini. First, obviously, is size. The Mini has a smaller footprint and capacity. You can’t cook a large chicken, turkey breast, or ham in it. But you can cook poultry parts or a small ham. It’s perfect for making side dishes, like beans, vegetables, or grains. If you want boiled eggs, the Mini does the job and is ideal for cooking only a few. Second, the wattage. The Mini uses less power than its big sister, yet I saw no significant cooking time difference with the exception of brown rice. Brown rice needed 28 minutes followed by at least 10 minutes natural pressure release. My 6 quart Instant Pot does the job in 22 minutes followed by natural pressure release. My stovetop pressure cooker takes 15 (and at least 10 minutes natural pressure release), so there is a difference. Just remember brown rice takes at least 50 minutes the conventional way. I also needed additional time for cooking dried beans. My anasazi beans take 30 minutes (plus natural drop in pressure) from dry to done but were too firm after 30 minutes in the Mini. However, most foods cook exactly the same as in the larger Instant Pot. Finally, accessories that fit your 6-quart will not fit the Mini. The Mini comes with its own trivet, though, as well as the rice cup, spoon, and ladle. And it has a good cookbook and instruction manual. I expect Instant Pot to introduce a new line of baskets, glass lids, and racks for the smaller size Mini, though. Bottom line: If you don’t own an Instant Pot and are undecided, buy the Mini. If you fall in love with the Instant Pot, you can always add a larger Instant Pot later and keep the Mini for side dishes. If you live alone or cook mainly for a couple, this Mini limits you to smaller pots of food but should work for you. If you have an RV, this Mini is the perfect size to travel with. Or if you’re like me and crazy about cooking, buy both the Mini and the 6-quart. And the 8-quart, too. You, too, can join the Instant Potheads subculture! I’ve tried quinoa and steel cut oats. They’re okay but my new grain passion is farro. It’s akin to brown rice yet twice as nutritious. I like the nutty flavor and chewy texture. It also cooks more quickly than brown rice. Stovetop it cooks in about twenty-five minutes, but I cook mine in my pressure cooker. Pearled* farro cooks in five minutes with a natural pressure release. I cook up a double batch of plain farro and refrigerate it for later use in salads, heated for a breakfast cereal, or added to a recipe designed for rice, risotto, or orzo. I don’t flavor mine when I cook it, although you could. Give farro a try in any dish you’d typically use rice or risotto. Add all ingredients to the pressure cooker pot. Seal lid and bring to pressure. Cook under pressure 5 minutes. Remove from heat (hit cancel) and allow pressure to drop on its own. Carefully open pressure cooker and stir. Serve warm or cold, flavored as desired. *Pearling removed the outer husks. Residual heat cooks the pasta without overcooking it. Chicken noodle soup is the quintessential comfort food, especially when you’re under the weather. But why pay for sodium-laden canned soup when you can make your own? For this batch of soup, I used the Instant Pot. The recipe is good for any pressure cooker. If you modify it for the slow cooker, don’t use frozen ingredients. I make my own chicken stock and store it in the freezer. I also keep a supply of frozen skinless, boneless chicken breasts and thighs. Using a few pantry and crisper items, I can pull out a jar of stock and a thigh and have delicious chicken noodle soup ready in an hour. Preheat the pot (on the Instant Pot use the sauté button). Add oil when the pot is hot. Sauté onions, celery, carrots, and pepper for two minutes. Stir frequently. Add salt and pepper. Turn off heat. Add the water. Using a wooden spoon, deglaze the pot of fond left on the bottom. Add the chicken, chicken stock, and bay leaf. Seal lid and bring to pressure, either by using the manual setting for 30 minutes or the soup setting, which on my Instant Pot defaults to 30 minutes. When time is up, turn off cooker and allow pressure to drop on its own (approximately 15 minutes). Carefully open cooker. Using a long handled utensil, break apart the chicken and stir soup. Saute onions, celery, carrots, and peppers. Add frozen chicken and stock. Add noodles after soup finishes cooking. Four delicious, additive-free servings of comfort! 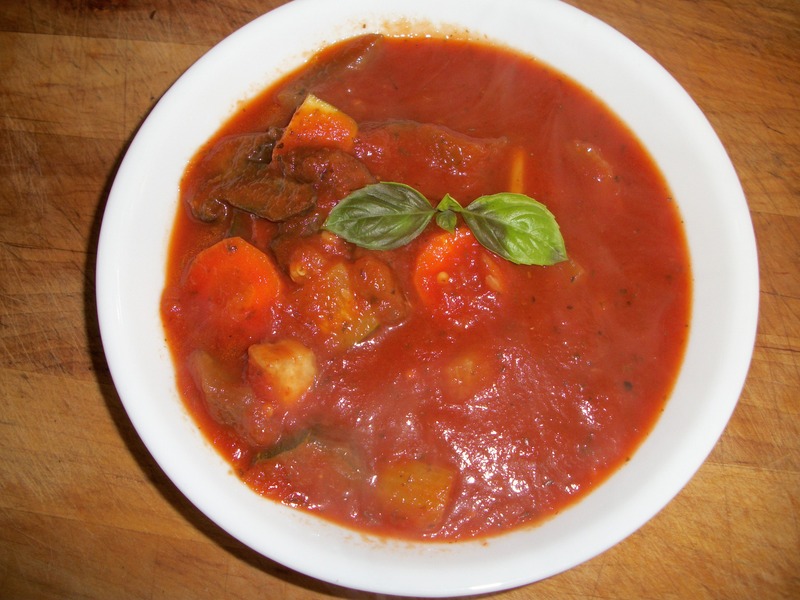 Ratatouille, or a veggie stew of Provence, is versatile and delicious. Originally French, it gets its flavors from Herbes de Provence, a distinctive blend of dried herbs that typically include savory, lavender, marjoram, fennel or tarragon, oregano, thyme, and rosemary . I’m still playing around with pressure cooker recipes, and this dish is ideal for HASTY TASTY MEALS UNDER PRESSURE (my work-in-progress). It’s also great for meat-free Mondays (or whatever day you want to go vegetarian). When I make ratatouille early in the week, I divide it into batches for weeknight meals. I add chicken and noodles for a chicken veggie stew, or broth and cannellini beans for a quick pasta fazool. I serve it as a stew over rice or puree it as a sauce and serve over pasta with fresh-grated Parmesan cheese. Note: For my readers who live in higher elevations, keep in mind my elevation here in Florida is about 100 feet. You will need to add cooking time if you live above 2000 feet. Add onions, peppers, and celery. Saute 2-3 minutes. Add garlic and Herbes de Provence. Stir until fragrant. Add eggplant, carrots, and zucchini. Cook for 2-3 minutes. Add all other ingredients except optional fresh basil. Close cooker lid and bring to pressure. When pressure is reached, lower heat but maintain pressure. Cook for five minutes. Carefully open cooker and ladle contents over bowls of rice or pasta, if desired. Garnish with a fresh sprig of basil. Ratatouille stores well up to three days in the refrigerator. It freezes well and keeps for 4-6 months in the freezer. *Electric pressure cookers cook for 8 minutes. My family loves spicy food, especially Creole and Cajun. One of our favorite dishes is Dirty Rice. Traditionally, Dirty Rice is made with rice and leftover livers, gizzards, and hearts from poultry. There is plenty of bacon fat and butter, too. Because I’m the only one in the family who will eat liver, and because we try to follow a heart-healthy diet, I’ve had to lean up and clean up traditional recipes. Here is my version of Dirty Rice. I use the Instant Pot electric pressure cooker, but I’ve made it in my cast iron dutch oven, stovetop, too. Just add cooking time and a bit more broth if you aren’t pressure cooking. Preheat pot without the lid using the sauté setting. When it’s hot, add the oil and butter. Brown the ground turkey sausage. Add the onion, celery, bell pepper, and rice. Sauté. Add the garlic and Cajun seasoning mix, remove from heat (hit “cancel”) and stir to “bloom” the spices. Pour in the broth and deglaze any cooked-on goodness to enhance flavor. Secure lid to cooker, and set for 20 minutes (If using a stovetop pressure cooker, cook for 15 minutes). When cooking time is up, remove from heat (hit “cancel” and unplug), and allow pressure to drop on its own a minimum of 10 minutes. Release any remaining pressure. Carefully open lid and stir to fluff the rice. Taste test and add salt or pepper as needed. Serve as a side or main dish. Be sure to bake cornbread to go with it. Some of my fondest memories of my father are of our runs together. One day, a couple of years before he died, we stopped near the end of our run at a neighborhood produce stand. Dad bought an assortment of fresh vegetables grown right there in the man’s backyard. I promised to cook whatever he bought. He spent about six bucks, total, and my family sat and ate as if it was Thanksgiving dinner. We love vegetables, especially locally grown, fresh produce. Our favorite summer dinner is a fresh-from-the-garden vegetable plate. If you haven’t taken advantage of the produce grown in your area, now is the time to indulge. Don’t restrict your menu. Plan your meals around what looks good and fresh, even if you have two or three green veggies. Corn on the cob, squash, potatoes, beans, broccoli, tomatoes…it’s all better when fresh-picked. Steam, grill, roast, sauté, pressure cook, microwave… Any way you slice it, cooking fresh produce is healthy, tasty, and good for the local economy. Vegetables cut for similar cooking times can share one pot. We love the spicy flavors of New Orleans style dishes, but we need to watch our waistlines. So I’ve lightened one of our favorites, red beans and rice, by using chicken sausage. I also serve with cooked brown rice instead of traditional white rice to boost fiber. By soaking the beans, I shorten the cooking time and avoid over cooking the sausage. Although my recipe uses the pressure cooker, you can cook it stovetop. It will take more time, but either way, you’ll end up with a healthy version of New Orleans style red beans and rice. Preheat pressure cooker pot and add the olive oil. Sauté the onions, peppers, and celery (known as the trinity in New Orleans). Add garlic and Cajun seasonings and stir for 30 seconds or long enough to “bloom” the spices. Add sausage and broth, and then seal cooker. Bring to pressure and cook 15 minutes (Or if using an electric pressure cooker, cook 20 minutes). Allow pressure to drop on its own at least 10 minutes. Release remaining pressure, carefully open lid, and serve in bowls over 1/2 cup brown rice. *If you prefer tomatoes in your red beans (we don’t), stir in a can of diced tomatoes after cooking the beans as soon as you open the pot. (For fiery hot beans, use tomatoes and green chilies!) The residual heat will warm the tomatoes through without cooking them to mush. Serve over a scoop of cooked brown rice. Remember walking into Grandma’s house when she had cabbage cooking in her kitchen? The entire house smelled like rotten eggs, right? Grandma insisted that cabbage was good for you, though, and you should eat it. She was right! According to many sources (such as Good Health All), cabbage is effective in fighting digestive, cardiovascular, and blood sugar issues as well as serving as an anti-inflammatory and vitamin source. It’s a nutritional gold mine. So why did it stink up Grandma’s house? She cooked it too long! Overcooked cabbage produces hydrogen sulfide gas, the source of that rotten egg odor. To avoid raising a stink in your house, don’t cook it like Grandma. Cook it fast. What better way to cook a vegetable quickly than in a pressure cooker? Quarter or shred your head of cabbage (or separate the leaves for cabbage rolls). Wash and drain. Add 1½ cups filtered water to the bottom of your pressure cooker pot. If using an electric pressure cooker, set for 5 minutes. Place cabbage in a strainer or steaming basket placed over the cooking water on a trivet or rack. Seal cooker. If using a stovetop pressure cooker, bring to pressure and then time for 3 minutes. After the 3 (5 on electric) minutes under pressure, remove from heat (select “cancel” on the electric model). Carefully release pressure. Open the cooker and season the cabbage with salt, pepper, and a pinch of sugar*. Carefully remove the cabbage and serve. That’s it. If you quickly cook cabbage just until done, you won’t stink up your kitchen. Promise. NOTE: Pressure cookers vary, so your cooking times may, too. The 5 minutes works on my particular electric model, and the 3 minutes is perfect in my stovetop pressure cooker. You may need to adjust your cooking time. Add cheese to cooked dish. If you’re a purist and want your pasta cooked separately, you can skip this post. The Hasty Tasty Meals Kitchen is about shortcuts, and cooking pasta in the sauce is a time-saver if done correctly. But it can be tricky. I cook pasta in the sauce in skillet meals, casseroles, and in the pressure cooker. The safety instructions for pressure cookers warn against cooking foods that foam, like pasta or grains, but don’t let that stop you. You just need to exercise caution. I do oatmeal in its own bowl on a trivet above the water, for example, with no problem. I’ve seen countless posts on Instagram and Facebook of beautiful lasagnas made in an Instant Pot or other brand multi-cooker under pressure in a springform pan. It can be done. When making pasta dishes in my pressure cooker, I prefer Mueller’s Pot-Sized dried pasta. It’s smaller length makes it a perfect fit without breaking. Here are the rules when cooking pasta, whether by itself or with other food. Don’t allow pasta to touch the bottom of the pot. Spread dried pasta in a single layer as much as possible and don’t stir. Use sufficient liquid to cover the pasta. Cook for only half the recommended time. Allow pressure to drop on its own for a minute then release in short spurts. Add cheese or other dairy products. If you follow these steps, you’ll have satisfactory results. Why go to the trouble to cook a spaghetti dinner in a pressure cooker? Clean up! I have one pot to clean. One. That makes me a happy cook. Cook for half the recommended time. Heat the pot of the pressure cooker and brown the ground turkey in the cooking oil. If using an electric pressure cooker, you can just choose any setting that allows you to saute with the lid off. Salt and pepper as desired. Remove pot from heat (or hit Cancel on an electric model). Layer pasta over the meat spread as thinly as possible to prevent clumping. Add the can of mushrooms, the tomato sauce, and the water or broth over the pasta. Do not stir. Sprinkle garlic and seasonings over sauce. Seal the cooker and bring to pressure. Cook 5 minutes. Allow pressure to drop on its own 1-2 minutes, then carefully vent the cooker to release pressure. Open the cooker and stir (use a long handled utensil because contents are hot!). Sprinkle with a mixture of mozzarella and parmesan cheeses. Residual heat will melt the cheese. Note: You may use this method with other shapes and sizes of dried pasta. Just cook under pressure for half the time recommended on the pasta’s box.